Reasons for why your back is so itchy can include an allergic reaction from certain hygienic products, chemicals, or plants. Another itchy back cause is shingles, also known as herpes zoster. Read below for more information on causes and how to relieve your back itch. An itch is an uncomfortable sensation on the skin that results in the urge to scratch. Scratching can be helpful in relieving an itchy sensation; however, it only offers temporary relief. There are several potential causes for a back itch, involving both the presence and the absence of a rash. Scratching associated with a back itch can also result in breaks in the skin that can lead to bleeding or infection, further exacerbating the issue. Though scratching is ill-advised, an itch on the back can be an especially frustrating symptom, as it often feels just out of reach and impossible to relieve. These symptoms may be localized to one area on the back or spread diffusely throughout the back. However, given the location, it may be difficult to see any skin changes related to a back itch without a second pair of eyes. On the other hand, at times a back itch may not be associated with visible symptoms at all — this highlights the importance of following up with your healthcare provider on any symptoms you may be experiencing. Although conditions associated with a back itch are not usually serious or life-threatening, making an appointment will go a long way in ensuring you receive appropriate care. An itch, also known as pruritus, occurs due to irritation or stimulation of cells and receptors on the skin mostly related to nerves. Multiple conditions can stimulate these nerve cells and cause itching . Skin conditions associated with a rash resulting in a back itch can include the following. Dermatologic: Many skin conditions such as eczema, hives, psoriasis and a variety of other illnesses that specifically affect the skin and its layers can result in localized itchiness on the back. Often, such conditions are also associated with symptoms such as redness, blisters or flaking. On the other hand, skin that is simply dry due to old age or temperature changes can also result in itchy skin. Allergens: The skin works primarily as a protective barrier and is very sensitive to environmental factors that cause localized irritation or allergic reactions. Allergens can include drugs, topical treatments such as soaps or lotions, certain fabrics or metals, plants, foods, and a variety of other substances. Itching that occurs serves as a warning or deterrent from using these irritants. Infectious: Multiple infectious pathogens, including bacteria, viruses, and fungi can cause itchy localized infections of the back. For example, varicella zoster is a virus that causes shingles, a very painful and itchy rash that often affects the back. Localized causes of a back itch that are not associated with rash or skin changes are rare and usually related to psychogenic (a psychological origin or cause rather than a physical one) causes. With rash: Metabolic conditions such as diabetes, severe renal disease and thyroid disease that affect the metabolic homeostasis of the body can result in itching of the back as well as other parts of the body that can be associated with a visible rash. Without rash: Conditions that affect the nervous system such as shingles, diabetes, and multiple sclerosis can also result in itching of the back and other parts of the body. The itchiness is generalized and the term “neuropathic itch” is often used to describe itching that occurs due to such causes. Blood conditions such as anemia and leukemia can also cause generalized itching without rash in addition to symptoms such as fatigue and weight loss. The list below shows results from the use of our quiz by Buoy users who experienced back itch. This list does not constitute medical advice and may not accurately represent what you have. You can stop or prevent many causes of back itch with simple lifestyle changes. Keep the skin adequately moisturized: We often overlook the back in skin moisturizing regimens, predisposing it to dryness. Using unscented, dermatologically tested lotions and moisturizing creams on the back can prevent skin dryness that can cause itchiness. Avoid allergens: Take note of symptoms that occur after using or ingesting certain substances and try to avoid them. It may be helpful to get formal allergy testing in order to be prepared and knowledgeable about your allergic triggers. Corticosteroid creams: If your itching is due to a rash or skin disorder such as eczema or dermatitis, corticosteroids are helpful given their anti-inflammatory effect in addition to their immunosuppressive role. Antihistamines: If your itching is due to an allergic reaction, your doctor may prescribe medications that fight the immunologic response causing your inflammation and itching. Light therapy (phototherapy): This treatment involves exposing the skin to specific wavelengths of ultraviolet light in order to help get the itching sensation under control. You should seek immediate medical attention for a back itch associated with abscesses that grow in size or become severely painful, as well as if you have a high fever, nausea or vomiting. Postherpetic neuralgia is a complication of shingles — a painful, itchy and blistering rash caused by the virus varicella zoster. Varicella zoster is a type of virus that can persist in the body and lie dormant in the peripheral nerves for years . When it reactivates, shingles results. Even after the resolution of the initial rash, some individuals may continue to experience severe pain known as postherpetic neuralgia in the area. Often, shingles and postherpetic neuralgia occurs on the lower or upper back. Pityriasis rosea is an acute skin rash characterized by red, oval and scaly lesions that often appear on the back . See an image of pityriasis rosea here. 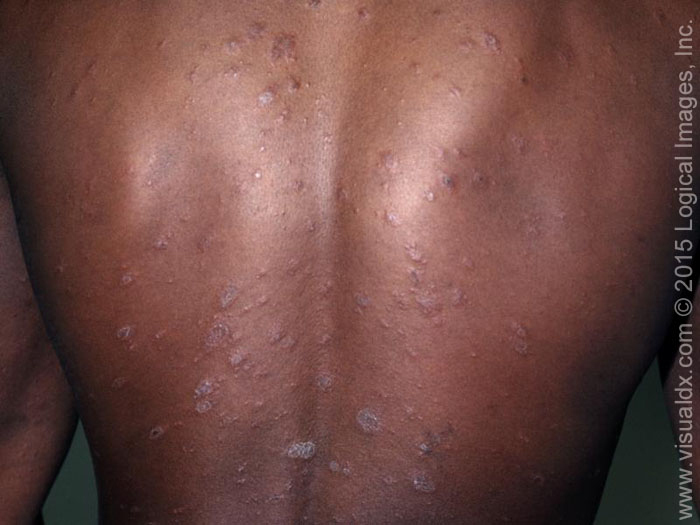 Often, the rash is described as having a “Christmas tree” distribution on the back and can be extremely itchy. Fortunately, this rash is self-limited and often resolves on its own with minimal treatment. Is a rash always associated with a back itch? No. Rash is often associated with a back itch in conditions that cause irritation or specifically affect the skin layers. However, in systemic conditions or conditions related to stress or certain allergens, there is often no rash present. What are the complications of back itch? Complications of back itch are usually the result of persistent scratching. Scratching can cause breaks in the skin that lead to infection or other skin injury. Furthermore, scratching can lead to scarring and thickening of the skin. Some areas of the back are difficult to reach, and as a result, these complications may occur less frequently in this situation. Are my symptoms of back itch temporary or chronic? Back itch can be either temporary or chronic depending on the underlying cause. Usually, once the offending agent is discontinued, back itch associated with allergens resolves. However, back itch associated with chronic conditions such as diabetes or liver disease can persist, especially if adequate treatment is not obtained. Is the red area flaky and rough to the touch? Did your symptoms start after you were exposed to glues, fragrances, preservatives, hair dyes, soaps, detergents, or other common household chemicals? Did your symptoms start after you were exposed to nickel (commonly found in jean snaps, metal pens, paper clips, cigarettes, etc.)? Understand your scalp itchiness symptoms, including 8 causes & common questions.